I'm starting a new section on Vegan Vs Travel - interviewing fellow travelling vegans to inspire us and answer some questions! Hey!! 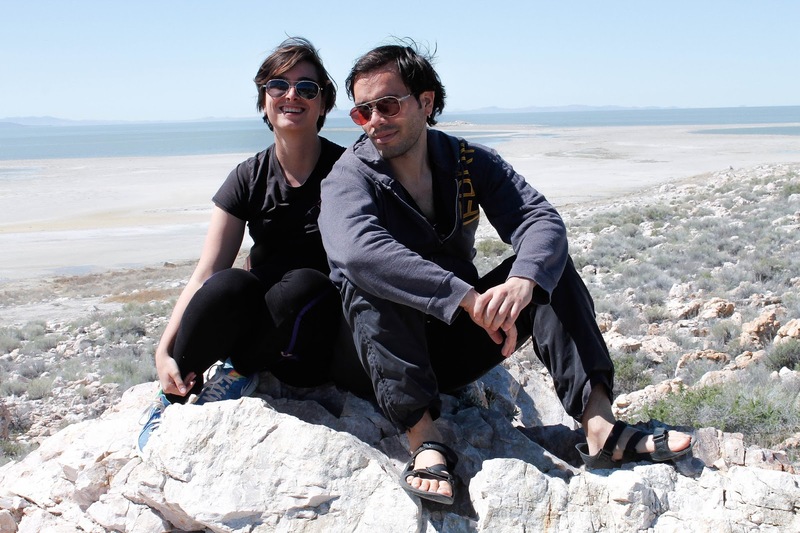 We are Sam and Veren aka the Alternative Travelers. We are originally from New York but right now we’re based in Madrid, Spain. 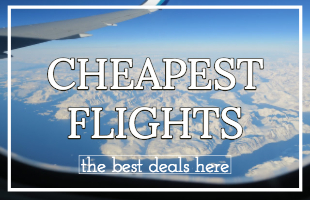 We slow travel on a budget via house sitting and we want show that neither traveling nor eating vegan has to be expensive or difficult. 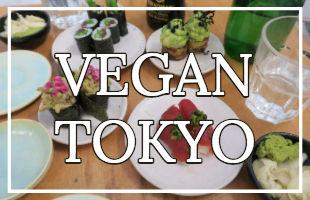 We do this by writing extensive (budget friendly) vegan guides and tell reflective stories on living and traveling abroad. Oof, there is so much we could say about that! We both came at veganism through different angles. Veren: I originally became vegan for health reasons and because it created a positive feedback loop. The more I did it, the easier it got, and the better I felt, so I stuck to it. I was mostly raw vegan in the beginning and it was very gradual – I didn’t go cold-tofurkey vegan. Sam: I first became vegetarian while living in Spain on my own a few years ago – mainly because I didn’t like pork and that’s the only meat they have in Spain! Then I started to learn about the ethical issues of eating meat, the environmental issues, and finally the health benefits once Veren and I met. He never pushed me at all but I dropped eggs and dairy and became fully vegan soon after we met. How do you find travel as a vegan? It’s not as hard as most people think! Ultimately we find it more rewarding than traveling before we were vegan. 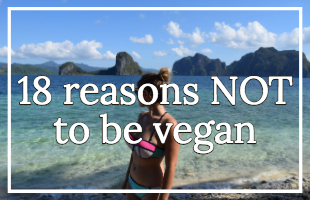 Veganism is on the rise and communities are still quite small, so we have ended up connecting with more people on the road. For newbie vegan travelers, we recommend doing some research. HappyCow is your friend, as are vegan blogs and Facebook groups! And pack snacks. It’s hard to say best vs worst countries because it varies so much whether you’re in a city or the countryside, no matter where you are. In the U.S., there can be fantastic vegan food and then an absolute wasteland one hour away. 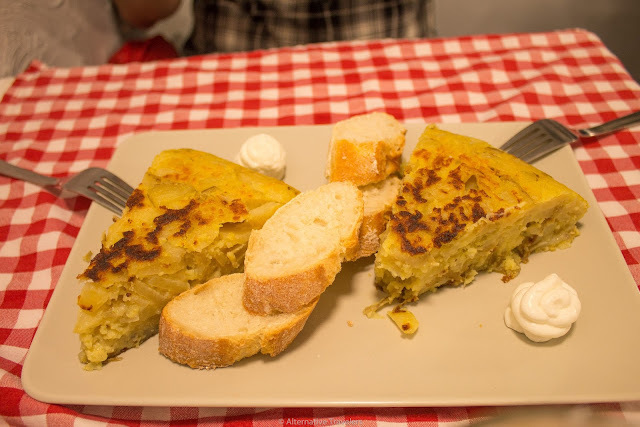 A vegan version of Spanish tortilla, a quintessential traditional Spanish dish, in Distrito Vegano in Madrid. It’s a complete load of bullshhh---poop. 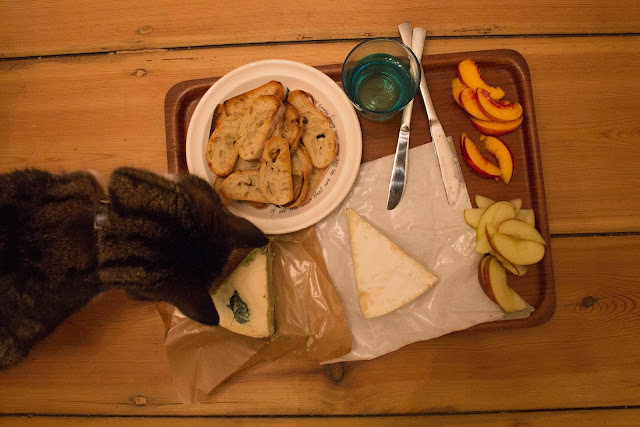 We always ask this – is a vegan from France any less French because they’re vegan? No. The idea of authentic culture isn’t created by the culture itself – it’s created by tourism marketing. We also like to bring up the example – should one eat dogs or cats in countries where those animals are in the traditional cuisine? Most people in Western cultures would say no. There are so many facets of a culture that vegans can experience without eating meat! Also, many cultures have traditional dishes that are naturally vegan or veganizable by removing or changing up a few ingredients. 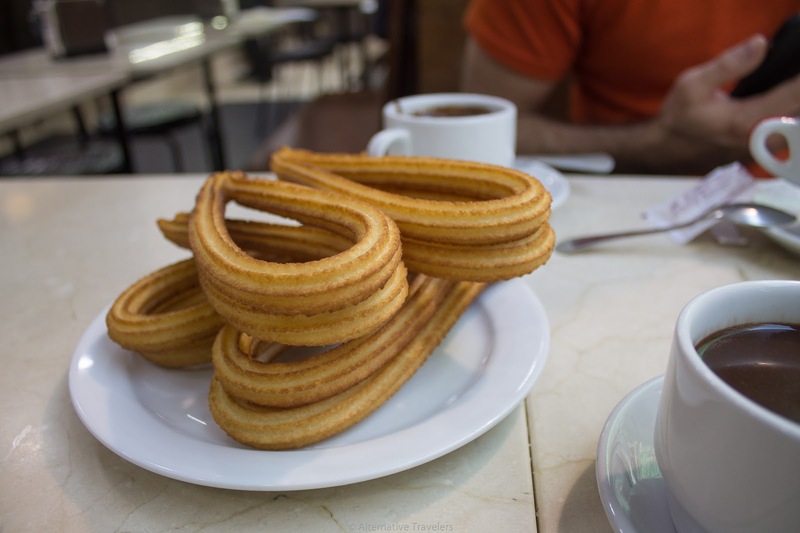 Case in point: churros are naturally vegan (just be careful of the dipping chocolate which may have milk in it) and favorite traditional Spanish food! Situation: you are travelling and a family offers you an authentic home cooked meal, you don't share a common language, what do you do? We usually learn some quick vocabulary so we can ask if something has meat, dairy, or eggs in it. If it had those things in it, we’d politely decline. Veren would likely mime some stomach pain and they’d get the gist. Would you actively avoid countries that are well-known to be not-so vegan friendly? 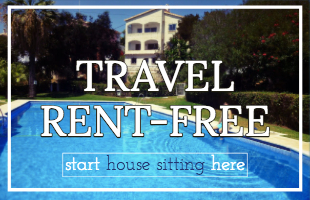 We tend to go places where we have a connection – whether it’s through house sitting, visiting friends, or even couchsurfing. So that would take precedence over the ability to eat vegan food out. While we like to eat out, we do cook at home a lot, so if a place doesn’t have vegan-friendly restaurants, we’ll cook. 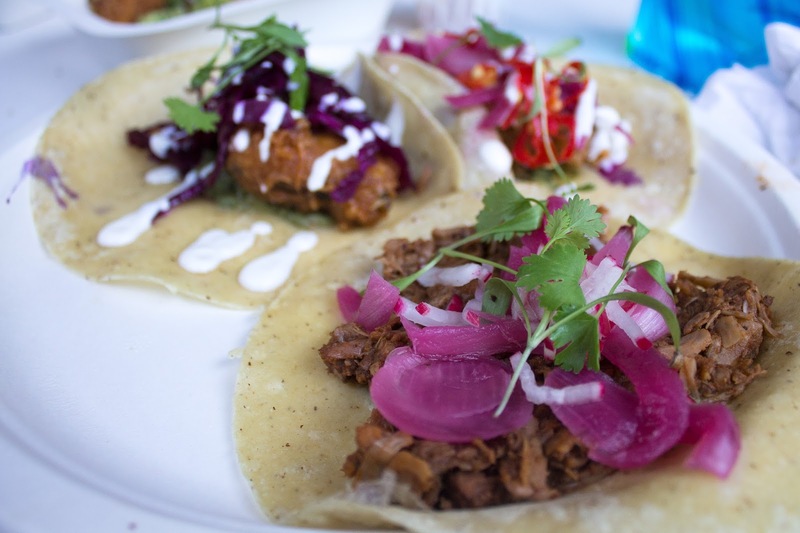 Faux fish tacos at Club Mexicana in London. That being said, if we had a choice over a vegan-friendly place and a non-vegan friendly place we’d probably choose the vegan-friendly one! 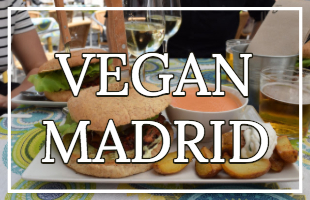 We’ve visited a lot of the most vegan-friendly cities in Europe and have had some truly incredible food. The vegan scene in Europe in general is pretty amazing. Vegans have a reputation for being smug, judgmental pricks who only ever talk about being vegan. Why do you think that is and what do you think can be done about it? It seems to have less to do with veganism and more to do with a lack of identity – you can find these people in all kinds of social movements. Vegans get a particularly bad rap because it challenges one of humanity’s most entrenched habits. It’s easy to spend a dinner without racism coming up, but it’s hard to have a meal (something you do 3x/day) without what you eat coming up. It whiffs of elitism because veganism has a moral basis, and no one likes to feel like they’re being judged. We say live by example and know your audience. We practice compassion and kindness with others rather than being confrontational. If someone is interested, we’ll gladly talk about veganism, but it’s also important to know when to not bring it up – aka at a meal where non-vegan food is being served as that will make people feel attacked. Some vegans forget that most of us used to eat meat, and we need to empathize with people’s struggles rather than making them feel alienated. Especially if the goal is to reduce animal product use. I feel like people's reasons for being vegan falls into three categories: the animals, health and the environment, if you had to put those three in order of importance to you, what order would that be? We thought about this question so much and it’s really hard to separate them all as they’re all inter-related. At times we’ll feel like the environmental impact is the most important, at other times we’ll feel like the animal aspect is the most important, and on a daily basis, we feel great because we’re eating plant-based food. All those categories are so connected, for example, the environment also encompasses animals as the destruction of habitat for animal agriculture leads to the extinction of species and a loss of biodiversity. We’ve been focusing on making our travels more sustainable now, so the environmental aspect has been more on our minds recently. We talk more about problems within the sustainable travel movement in our post: We Need to Talk About Sustainable Travel. Btw, we know that’s all kind of a cop-out answer since we didn’t rank the categories! Veren says he’s ok with not answering this question, Sam apologizes for him. Tell us why house sitting is perfect for vegans! House sitting is great for vegans for soo many reasons!! Number one – most vegans love animals and house sitting usually comes with one or many cute animals. Trying vegan cheeses in Berlin with the help of our house sitting charge! Number two – kitchen access. Any traveling vegan will know how much easier it makes traveling because you can prepare your own food. Also it saves tons of money so if we are in a vegan-friendly place, we get to eat out more! What's the best and worst thing about being vegan? Best – being able to eat tons of amazing food – it’s exciting to be part of such a creative movement. We can enjoy food and other products without detrimental effects to animals, the environment, or our own bodies. Worst – not being able to share a meal with other people. The hardest part of being vegan is other people. Most vegans just want to be able to share a vegan meal with their friends/family. What do you think the best and worst things are about being vegan? Let us know in the comments below! Thank you to Sam and Veren for their answers, give them a follow on their blog, Facebook and Instagram!